I recently returned from an invigorating trip to the Natural Products Expo in Baltimore. I met the innovators behind some of my favorite foods, and was introduced to new products that are high on my wish list. Clients and friends have been asking for a full debrief, so here it goes! Like many of you, my mornings are busy between getting my kids on the school bus, checking work emails and prepping for my morning clients. 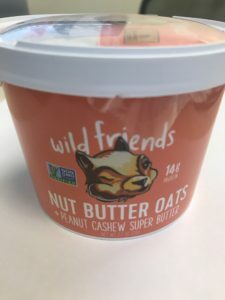 Wild Friends’ new Nut Butter Oats will be a go-to staple for what I call “emergency meals”. Packed with gluten-free oats and a packet of Wild Friends Super Butter, this portable on-the-go meal provides the protein and fiber I need to stay fueled and focused. Available in two flavors: Peanut Cashew Super Butter and Almond Cashew Super Butter! Nutritional Profile: 1 serving 375 calories, 14g of protein and 7 g of fiber. Avocados are a nutrition powerhouse and a staple in my diet. Rich in vitamins, minerals, heart healthy fat and fiber, avocados will add a nutrition boost and creamy deliciousness to any meal. When I stumbled across these smoothie bowls I was blown away by the inventive concept, cute packaging and portability. Filled with real food including avocado, additional fruits, veggies and a quinoa crunch topping. Yes, please! Nutritional Profile: 1 serving 180-210 calories, 3g of protein and 8 g of fiber. Already a huge fan of Barney Butter’s 0.6oz packets of almond butter, and they’ve added a new flavor to the lineup, chocolate! Perfectly portioned as a healthy fat serving, this chocolate flavored almond butter will be scrumptious, paired with high fiber crackers, strawberries or an apple. Nutritional Profile: 1 serving 100 calories, 3 g protein and 2 g fiber. This was love at first taste. The perfect combination of crunchy roasted chickpeas and smooth dark chocolate to satisfy my 4 PM sweet tooth and keep me fueled until dinner. Nutritional Profile: 1 serving 130 calories, 4g of protein and 4 g of fiber. Already a devotee to their line of dry roasted chick peas (yes, clearly I love chickpeas), I was ecstatic over this new product, Crispy Fava Beans and Peas. If you can make a chic pea crispy, crunchy and snackable why not do the same to fava beans? Available in three flavors: Sea Salt, Habanero Citrus and Balsamic Herb. Nutritional Profile: 1 serving 120 calories, 7 g protein and 3 g fiber. I’m working hard to get samples for my LMN clients. Stay tuned.